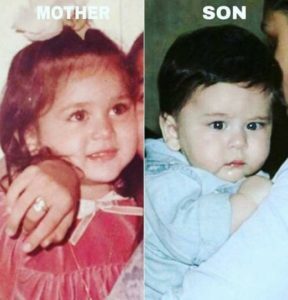 The little Taimur looks like his mom when she was a child. Taimur will soon be turning two and he is already making a buzz on social media sites with his cute pictures and videos. He has her eyes and fluffy cheeks. Another kid who looks like her mom when she was a child is Nitara. Nitara is the daughter of Akshay Kumar and Twinkle Khanna. Nitara even has bubbly girl persona just like her mom. 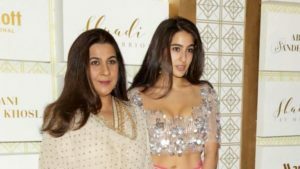 While Sara Ali Khan, daughter of Saif looks exactly like her mom Amrita Singh, Ibrahim has taken genes off his father. 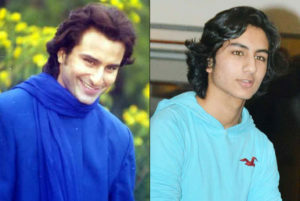 Saif revealed that Ibrahim looks forward to be a bollywood star. The long nose seems to run in this Pataudi family. Often kids tend to look like either of their parents, but Shah Rukh and his elder son Aryan have a very uncanny resemblance. 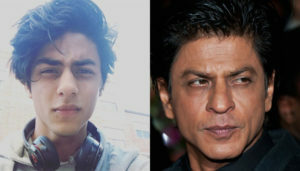 Not just Aryan, even Shah Rukh’s younger son Abram looks exactly like his father. Both his sons have permanently inherited his cute dimples. Aryan is pursuing his graduation in London. He plans on to become actor soon. Look at how incredibly alike this mother-daughter look. Sara is as gorgeous and talented as her mom. She is presently filming the movie “Simmba” opposite Ranveer Singh, directed by Rohit Shetty. 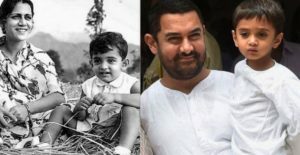 Azad reminds us of young Amir Khan. The father-son duo has got a similar set of ears. Amir’s son is now 6 years old and rumors are he is intelligent just like his father. 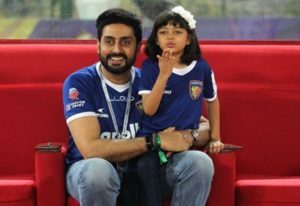 Aradhya, daughter of Aishwarya Rai Bachchan and Abhishek Bachchan, looks most like her father. Her chubby cheeks resemble with that of her father’s. Aaradhya is also gorgeous just like her mom Aishwarya. She is often seen accompanying her mom to events. She also visits Cannes film festival with her mom and from past two years, we have seen her pics in some gorgeous attire just like her mom. Yug looks like a carbon copy of his mother when she was a baby. 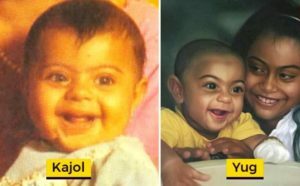 Yug is the son of Kajol and Ajay devgan. He also has eyebrows exactly like his mother. Their childhood photos are the proof of how exceptionally similar they both look. 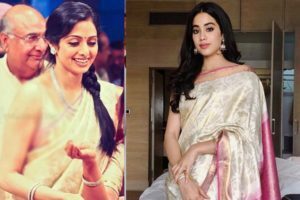 Jhanvi Kapoor is the daughter of one of the most talented actress Sridevi and Boney Kapoor. Jhanvi looks so much like her mother, they might seem twins to any person who wouldn’t know them. Jhanvi made her debut this year with the movie Dhadak starring opposite of Ishaan Khattar. Earlier this year, Jhanvi lost her mother which was shocking to the whole nation. Mahesh Bhatt’s daughter Alia looks very much similar to her mother Soni Razdan. The mother-daughter duo was recently featured in the movie Raazi. 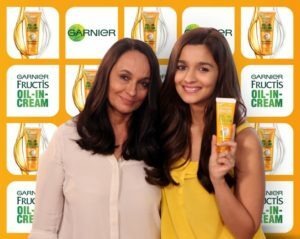 Alia is said to have a special bond with her mother.